← Weston “Wes” V. Wilbur Jr.
Dora J. (Cramb) Dunton, 72, of Fitzwilliam died on Friday, January 25, 2019 at Cheshire Dartmouth-Hitchcock Medical Center in Keene. She passed peacefully with the love of family by her side, after a period of declining health. Dora was born the daughter of the late Dora I. (Peacock) and Frank G. Cramb on April 18, 1946 in Malden, Massachusetts where she attended local schools. On May 11, 1963 she exchanged vows with James “Jim” N. Dunton in Winchendon. They were married in a simple service with close family and friends in attendance. They were married for fifty-five years. She was most happy being at home raising her children and handling the day to day tasks in the home. Her time at home was special to the children because mom was always there to give rides after school, help with homework and have special meals made for them. 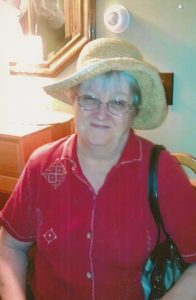 She enjoyed crocheting, camping with family and friends, swimming and especially baking and cooking. Mrs. Dunton is survived by her husband, Jim N. Dunton of Fitzwilliam. Her children and their spouses; Bruce Dunton and his wife Nancy of Fl. Rhonda Sheats and her husband Bucky of Troy, Douglas Dunton and his wife Edna of Fitzwilliam, James Dunton and his wife Lisa of Fitzwilliam, Lisa Lagerberg and her husband, Scott of Swanzey and Fern Duffy and her husband Daniel of Ashburnham, MA. Her siblings; Joan Aubrey and her husband John of Everett, MA. Christine Panniello of Billerica, MA. Phyllis Sesia of Rindge and Donald Cramb of Rindge. Sadly, she will be missed by her; 13 grandchildren, ten great grandchildren, cousins, nieces, nephews, extended family and friends. Dora is pre-deceased by her son, Frederick Dunton who passed on July 7, 2013. Her siblings; Frank Cramb Sr. and Florence Olsen passed earlier.